Bagru Kalamkari print chanderi sarees supplier in Jaipur is a well-known manufacturer as well as supplier of wide cluster of chanderi sarees. Owing to our in-depth knowledge as well as expertise, we strive to produce beautiful collections of Kalamkari print chanderi sarees to our esteemed clients. Keeping in mind the rising trend of modern fashion and style, each and every saree is being stitched using a cutting-edge technology and under the vigilance of an expert professionals. 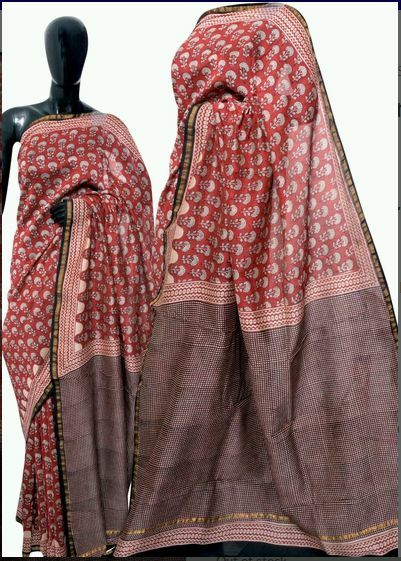 As a reputed Kalamkari print chanderi sarees supplier, our products are widely known for its superior quality, color fastness, durability, sheen as well as easy to maintain.